Non-domestic EPCs came in to force on 1 October 2008. Up Energy had qualified Level 3 EPC Energy Assessors from day one and within a couple of months, had added the Level 4 EPC qualification. I am delighted to say that we now are Level 5 EPC assessors. Level 3 – this is the majority of commercial buildings within the country, those with simple heating systems (low temperature hot water systems, room heaters or simple air conditioning systems, for example). Level 4 – buildings with more complicated air conditioning systems, such as water fed fan coil units or VAV systems. The other key difference is that all new buildings (except those classed as Level 5) are assessed under Level 4. 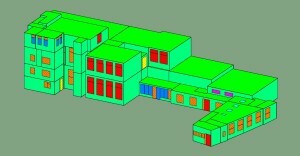 These assessments are desk based and the energy performance of the building is calculated from plans and specifications. The EPC also forms part of the submission to comply with Building Regulations, alongside the SBEM calculations. A level 5 EPC is typically required on new buildings, following the completion of the BRUKL document. These are submitted to Building Control and the EPC also forms part of the handover documentation, alongside the building log book, once practical completion is reached. However, it is feasible to do a level 5 EPC using dynamic simulation modelling on any building. It would potentially be overkill on a small shop unit or a simple warehouse building but on a mechanically cooled office building, for example, it may be a better option. DSM allows more accuracy in terms of analysis but also modelling. External shading devices can be included within the calculations and these, for example, may help reduce the energy requirements of a ventilation or cooling system and therefore improve the building energy rating. For further information on EPCs, take a look at the UK government or the CIBSE websites and if you need a level 5 EPC assessor, then please get in touch and we would be happy to help.